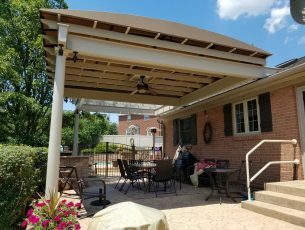 Stationary Canopies | Kreider's Canvas Service, Inc. 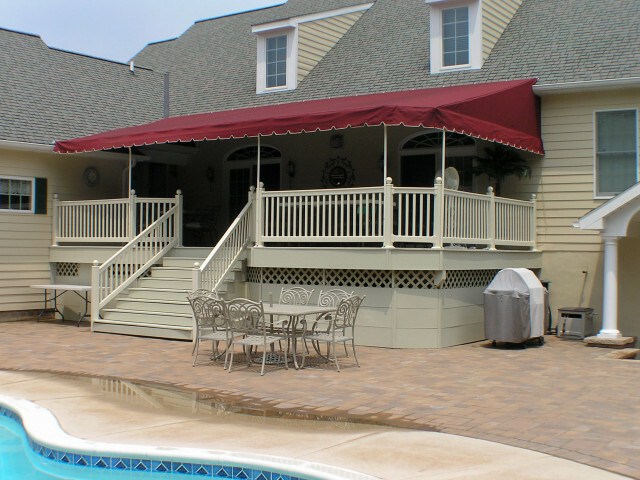 Tired of not being able to use your deck or patio area during the summer heat or rain? 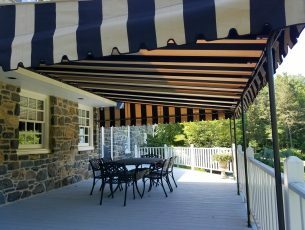 Cool off with a custom-made stationary canopy from Kreiders! 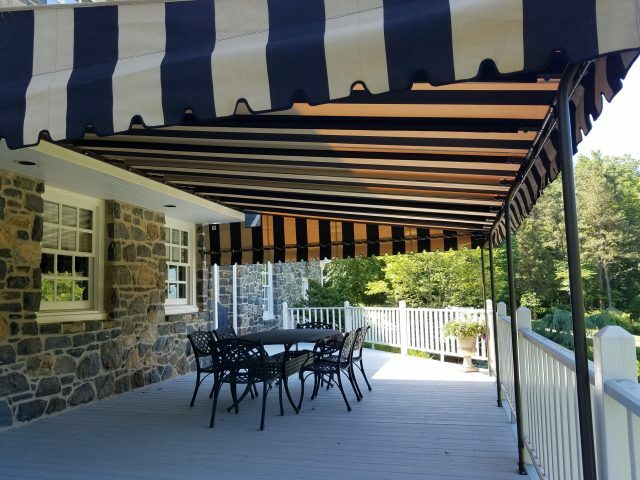 All awnings are sewn and manufactured at our shop by experienced professionals using only the finest materials, piping and hardware available. Save money by lowering in-house temperature up to 25% during summer. Remove in winter for optimal solar gain. Protect and preserve doorways, decks and windows from harsh weather and sun. Reduce undue fading of interior carpets and furniture. Superior service and quality craftsmanship at an affordable price. Wide variety of styles and colored fabrics to choose from. No need to bring cushions in from outdoor furniture when rain is forecasted. 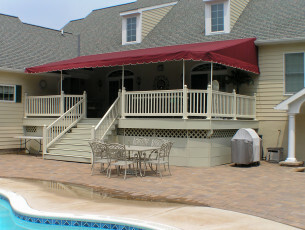 Fabric awnings add functionality and beauty to a home. This canopy covers over a large patio providing a shaded and dry outdoor living area. The galvanized frame is powder coated and the fabric is a Sunbrella black and tan stripe pattern. Notice the screen vents towards the back of the wing area. This allows any trapped heat under the canopy to escape. 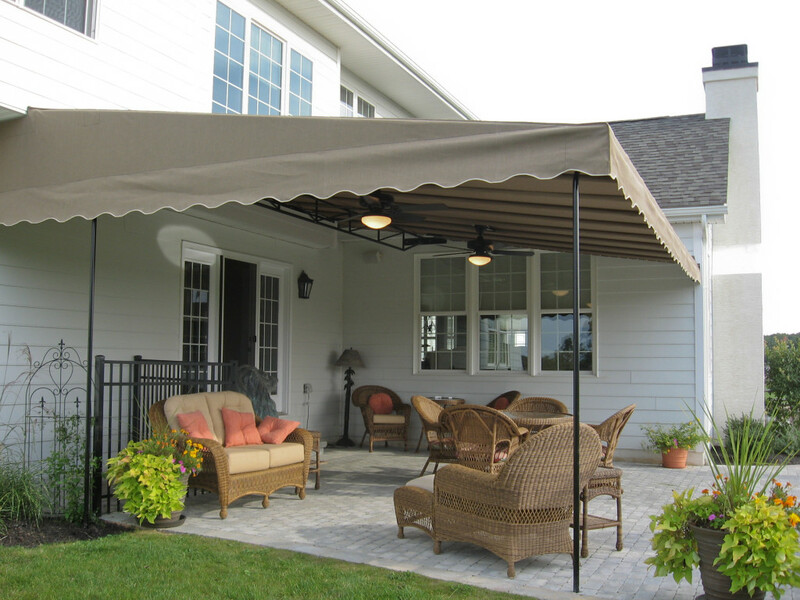 Pergolas provide a cozy feel but are lacking when it comes to providing shade and rain protection. The arched cover installed across the top of this existing pergola will shed water and provide the needed shade. The framework for this cover is custom designed and fabricated from square aluminum tubing and then powder coated a bronze color. The fabric is stretched on drum tight and is removable during the off season.